Meridian Park Historic District contains an outstanding collection of Arts & Crafts architecture. Lovers of bungalows will not want to miss this district. Located north of Fall Creek, Meridian Park represents the northward residential growth of the city in the early 20th century. Elias Atkins filed a University Place plat in 1890 in the area, and by 1904, other developers had subdivided the former farmland into residential lots. One principal addition was called Meridian Park. 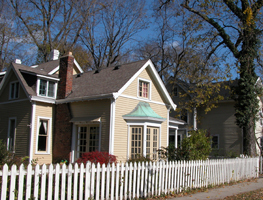 While Meridian Park has a small number of late 19th century and some contemporary buildings, a majority of homes date from the early 20th century. Most have typical Arts & Crafts details such as overhanging eaves, knee braces, exposed rafters, and low horizontal lines. Tudor Revival, American Four-Square, Colonial Revival, and more exotic influences are evident in the design of other buildings. The architecture demonstrates how well Indianapolis architects absorbed Arts & Crafts tenets. In 1907, Frank Bakemier built the house at 3128 North Pennsylvania Street for George and Nellie Meier, who called it “Tuckaway.” This low-slung bungalow with brown-stained wood weatherboard siding is among the better preserved Arts & Crafts homes in Indianapolis. The Meiers were as quirky as their new modern home. George was a well-known fashion designer and buyer for L.S. Ayres Department Store, and Nellie was a famous psychic whose clients included many national celebrities. The house at 3127 North Pennsylvania was designed in 1909 by Lawrence George for Will H. Brown, vice president of the Overland Auto Company. The home’s stucco and half-timber upper story with oriel windows and simple lines reflects Arts & Crafts influence. The district also includes a residential court, called Washington Court, located in the 3200 block off Washington Boulevard. Jose-Balz Company designed and built most of the eleven bungalow, Craftsman, and American Four Square houses in this part of the district. Indianapolis has few of these Bungalow court style developments. Meridian Park Historic District is located on the north side, including North Pennsylvania St., Delaware St. and Washington Blvd. between 30th and 34th Sts. All homes are private. INDYGO bus line from downtown: #18 Nora, disembark at 34th St.